TLDR Up Front: The Islamic State of Syria & Iraq (ISIS, ISIL, Daesh) is just the latest in a series of names for a salafist takfiri group, each representing a shift in their strategy and geographic perspective, as well as efforts by opponents to portray them in a negative light (eg. Daesh); which have largely been abandoned except in social media. al-Zarqawi, a Jordanian born salafist takfiri, founded what would eventually become known as ISIS in 1999 out of a training camp in Herat Afghanistan. (3) The goal of the group, Jamaat al-Tawid wa-l-Jihad (JTWJ) (Organization of Monotheism and Jihad) originally was to overthrow the “apostate” Kingdom of Jordan and from there expand to encompass the Levant. The Levant in this context is in reference to the old Ottoman holdings of a region that includes roughly Jordan, Syria, Lebanon, Israel, Palestine. This is key because from the very beginning al-Zarqawi had territorial ambitions – whereas Al-Queda wanted to act more like a venture-capitalist of salafist takfiri – funding diverse groups and connecting them only loosely through an overall strategy. JTWJ primarily recruited and trained foreign fighters, predominantly Jordanian, as opposed to Taliban Afghans and was only loosely linked with Al-Queda at this time. Zarqawi and bin Laden personally, as well as their leadership styles and militants surrounding them culturally and ideologically. (3) Zarqawi refused to offer baayt (allegiance) to Osama bin Laden or Al-Queda even though he received some minor funds from AQ. In 2003 al-Zarqawi moved JTWJ into Iraq and began conducting operations against the US and coalition forces. In a 2004 announcement JTWJ became Al-Queda in Iraq as al-Zarqawi finally pledged baayt to Osama bin Laden. In return bin Laden declared “We ask God to accept this unity and bless it and for all to know, the dear mujahed brother Abu Musab al-Zarqawi is the prince of al Qaeda in Iraq, so we ask all our organization brethren to listen to him and obey him in his good deeds.”(5) This is a key point because bin Laden refers to al-Zarqawi as the “prince” – a leadership position that would indicate him (and presumably AQI) would not be subservient to other AQ affiliates, a key point that comes up again in 2013. AQI shifted the al-Zarqawi’s strategy of seizing territory from which to seize the Levant from Jordan into Iraq. As part of this strategy al-Zarqawi began recruiting other militant groups to form an army, but his brutality and strict takfirism sparked a Suuni-Shia sectarian war and a backlash from Suuni tribesmen known as the Anbar Awakening. This led to a rapid decline in AQI strength and operations. Al-Zarqawi was killed by US forces in 2006. The effort begun by al-Zarqawi to form an umbrella organizations of salafist takfiri militants in Iraq continued after his death and Al-Queda in Iraq was absorbed into the Majlis Shura al-Mujahedin (MSM) in 2006. In addition to Al-Queda in Iraq the Mujahadeen Shura Council included Jeish al-Taiifa al-Mansoura, Katbiyan Ansar Al-Tawhid wal Sunnah, Saray al-Jihad Group, al-Ghuraba Brigades, and al-Ahwal Brigades. Two individuals emerged as the leader of the MSM. Omar al-Baghdadi considered by some as a ruse or figurehead and al-Masri, a military leader and key lieutenant of al-Zarqawi. 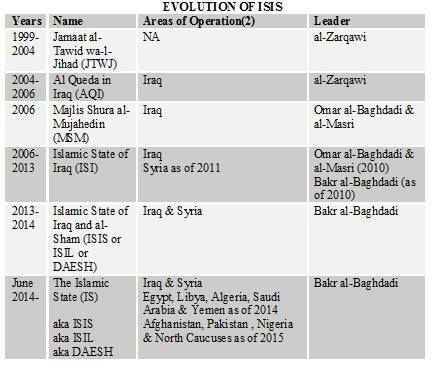 Shortly after forming the MSM the group changed its name to the Islamic State of Iraq (ISI). This is the first time that the militants openly used “Islamic State” making a claim to a caliphate level aspiration, though at the time and until 2011 ISI was only a few hundred fighters barely hanging on. was made into an acronym DAESH which also has the benefit of sounding like a belittling term. (4) Again the name change is significant both for geographic as well as political reasons. Geographically ISIS had never abandoned al-Zarqawi’s original goal of a ‘greater caliphate’ encompassing the historical boundaries of the Levant and Iraq. (And in historical context that Levant referred to more countries than modern day Syria so to does the historical meaning of “Iraq” included not just Iraq but Kuwait and most of Saudi Arabia as well). Politically, ISIS had just captured Ar-Raqqah was captured from other Syrian rebels. This highlighted how the frictions of thought and approach between bin Laden and al-Zarqawi continued to fester even after the death of both leaders. Although ostensibly part of Al-Queda until late 2013, ISIL paid little heed to the strategic direction of bin Laden’s successor al-Zawahri who instructed them to be subordinate to Al-Nusrah, AQ’s chosen affiliate in Syria. Remember, al-Zarqawi had been declared “Prince of Iraq” by bin Laden and his successor al-Baghdadi felt little need to bend a knee to the AQ franchisee in Syria Al-Nusrah. Instead ISIL made the remarkably bold move of declaring Al-Nusrah part of ISIL, without asking Al-Nusrah about it first. A hostile take-over that would leave even most merger & acquisition firms envious. This occurred late summer 2013, about the same time President Obama backed away from the ‘red-line’ in Syria that led to a collapse of support for the moderate factions of the Syrian War (FSA). As fighters joined increasingly radicalized groups they split between the Al-Queda affiliate Al-Nusrah and ISIL. This led to outright fighting between the two and the formal break with Al-Queda. Based on this success al-Baghdadi instituted a final name change, shortening the Islamic State of Iraq and al-Sham to simply the Islamic State and declaring itself a global caliphate. Although roundly mocked by Islamic scholars of all denominations, this name change again telegraphed ISIS’s strategic priorities, shifting from a localized theater of Syria and Iraq to a global theater. Although the Islamic State has no formal recognition by any country – it has since gained allegiances (baayt) in several countries by often already-extant local insurgency groups that hope to benefit from ISIS’s finances, technical knowledge and sophisticated propaganda efforts. Most notably this includes the insurgency in the Sinai region of Egypt which was one of the first organizations to side with ISIS. As well in 2015 Boko Haram, a previously independent insurgency that had been courted by both AQ and ISIS swore baayt to al-Baghdadi joining ISIS. And in mid-2015 following the report that Mullah Omar’s death had been suppressed by the Taliban several formerly Taliban warlords swore baayt to ISIS as well. In addition to these three key areas ISIS has also received oaths of allegiances from insurgent groups operating in the North Caucuses, Pakistan, India and Yemen. (1) Aaron Zelin, “The War between ISIS and Al-Queda for Supremacy of the Global Jihadi Movement,” Research Notes – Washington Insitute for near East Policy No. 20 (June 2014): p6. available from https://www.washingtoninstitute.org/uploads/Documents/pubs/ResearchNote_20_Zelin.pdf. accessed September 19th, 2014. (2) U.S. Department of State. Country Reports on Terrorism Chapter 6: Terrorist Groups. ONLINE 2004-2013. Bureau of Counterterrorism. Available: http://www.state.gov/j/ct/rls/crt/index.htm [19 Sep. 2014]. The entity now known as the Islamic State first appears in Country Reports on Terrorism in 2004 under the name Tanzim Qa’idat al-Jihad fi Bilad al-Rafidayn. (3) Zelin’s article provides more depth to the socio-economic differences between bin Laden and al-Zarqawi. The former an elite-scion and college educated “big picture” thinker while the latter was born into poverty, “street” educated and more comfortable with the brutality of the battlefield. This division even spread to the leaders and followers each individual attracted. These differing perspectives contributed to strategic split about the nature of apostacy, the legitimacy of targeting Muslims and the contrast between “purging Islam to save it” (al-Zarqawi) and “building institutions of jihad” (bin-Laden) which continue to this day marking wide schism between ISIS and AQ affiliates. InfoMullet: Who can be Sirte-n if its Barqa is worse than its bite? HistoricalMullet: Are we at the precipice of formless war?